Microcredit has been met with immense enthusiasm in China in recent years, with both banks and business moguls pushing into the sector. 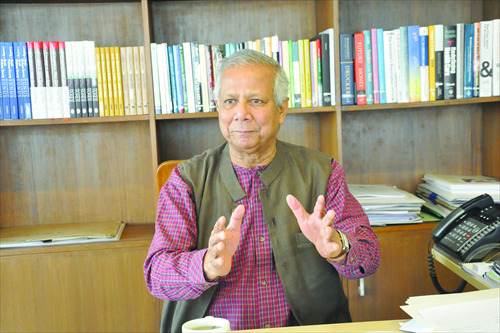 Global Times (GT) reporters Gu Di and Liu Zhun talked to Muhammad Yunus (Yunus), a Bangladeshi social entrepreneur, economist, and microcredit icon. For founding Grameen Bank, a bank that makes small loans to the impoverished, he was awarded with the Nobel Peace Prize in 2006. Yunus shared his understanding with GT of why microcredit is flourishing in China and how China's "One Belt and One Road" project could influence the field. GT: Almost 10 years have passed since you were awarded with the Nobel Prize. In the interim, you have met many criticisms and doubts. What do you think of them? Yunus: There are a lot of scathing voices against microcredit. Some said it is not really helping the poor, or the effect is not as apparent as we expected. Some said the system doesn't work in many other countries, and even negatively influences poverty alleviation. But we can note that there has been little blame directed toward Grameen Bank. Grameen Bank has been operating very soundly. It is microcredit as a whole that has been blamed. The reason why microcredit has encountered so much suspicion is that people have failed to understand what microcredit really is. Microcredit pursues profits, but it begins from helping the impoverished. Loans that simply aim at making more money cannot be microcredit. Grameen Bank has many branches around the globe. In the US, there are 19 branches. Each one of them is working well, and the repayment rate is nearly 100 percent. GT: Why do developed countries like the US need microcredit, as they have well-developed social welfare systems? Yunus: Actually, this is the common problem of capitalism. Countries may be rich, but the living standard of ordinary people might be low. In the US, you see a lot of advertisements in newspapers and TV about payday loans with [annualized] interest rates as high as 500 percent. Many poor people are not qualified to ask for loans from banks because they have no collateral, and can't even get payday loans because they are jobless. In this case, people like them need microcredit organizations like Grameen Bank. In New York, we have over 26,000 borrowers with an average loan of $1,500. GT: Your intention to get involved in politics caused quite a stir a couple of years ago. Why did you have such ideas? Yunus: Although Grameen Bank and microcredit has helped a lot of poor people in Bangladesh, there had been more and more people coming to see me and tell me that I should enter politics so that I will be able to help more people. Then I had to start to found a party. But soon I realized that being a politician never attracted me, and might come at the expense of my undertaking to promote microcredit. At last, I gave up the idea and never went through with the plan to build a party. Now I don't have the slightest interest in going into politics. GT: How is Grameen Bank and microcredit going in developing countries? Yunus: Grameen Bank helps people who are not accepted by the traditional banking system. The money is raised from local communities, and used for local people. It won't be transferred from one place to another, so there is no issue with our investments in developing countries contradicting those in developed countries. In fact, we copy exactly in each place. How we do this job in Bangladesh is how we do it in China. GT: Grameen Bank has established cooperation with Alibaba and JD.com, both of which are major Chinese Internet companies. Why do you choose private enterprises to get engaged in this undertaking? Yunus: We had run into a number of problems when we tried to manage our business by ourselves. For example, in large areas such as Inner Mongolia, the large expanses of land and various weather conditions posed great threats to our work. Another critical matter is that it is very hard to get money from China's banking system, which is somewhat rigid. Even though we got approvals, we also had to deal with other problems such as local government malpractice. This makes us realize that we have to work with local private enterprises to raise enough funds. GT: Grameen Bank was initially developed as a project to help the impoverished in Bangladesh, but now it has extended beyond borders. Do you think this multinational undertaking will be able to connect with China's "One Belt One Road" project? Yunus: As a social enterprise, Grameen Bank and microcredit need to establish close relationships with local companies and organizations. As for Bangladesh and the region associated with the project, what China brings is inter-connection of communications and an open market. Bangladesh is at the crossroads connecting South Asia, Southeast Asia and China. More convenient transportation and an open market will attract more companies into Bangladesh and other neighboring countries. Then Grameen Bank will be able to engage in bigger cooperation with these enterprises. Prosperity in microcredit is in line with the progress in the "One Belt One Road" project. I think the major problem is that countries involved have not reached an agreement about the openness of markets. Each nation has its own concerns. But considering the apparent benefits, countries along the way should be more positive toward China's project. GT: As an economist, what do you think of the "new normal" of the world economy, especially the Chinese economy? Yunus: The Chinese economy has sustained growth rates ranging from 8 to 9 percent, and sometimes even double-digit growth rates. But after the global financial crisis, few countries can maintain such high growth rates, because the general situation of the world economy has changed. Chinese policy-makers are seeking economic transformation by employing many approaches such as promoting consumption to fuel economic growth. I think the slowing of growth is not a bad result. On the contrary, it is more reliable and practical. The slackened growth rate, if stabilized, can become a normal state of economic development. As long as there are no long-term fluctuations, I think we can maintain an optimistic attitude.